All propane cylinders must be inspected and re-qualified every 10 years in order to be re-filled. There are no exceptions! A new relief valve is installed, and the date stamp is embedded in the collar of the cylinder to show the latest inspection date. If a cylinder has reached its 10-year expiration date, and fails to pass the visual inspection, it must be properly disposed of. Dodsley Propane accepts out-of -date cylinders. Automotive tanks must be inspected every 5 years to re-qualify for filling. 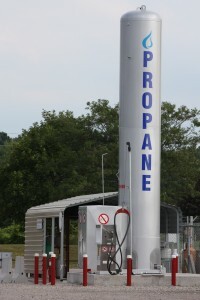 Dodsley Propane is not licensed for automotive tank re-certifications. Please call or visit Dodsley Propane for more information.